I hate throwing things away. Ziploc bags, tinfoil, and egg yolks. Don't worry, you won't see me on the T.V. show Hoarders...yet! But recently I made my daughter's birthday cake. The cake was a home made "funfetti" cake, using mostly egg whites. I had a handful of egg yolks left over. Rather then throwing them down the garbage disposal, I whipped up a simple cake. It needed a little something special on top, so I tried a brown butter frosting to compliment the almond and orange notes in the cake. It was a big hit at work. One note, the cake was hard to get out of the pan, even with non stick spray. I recommend using some parchment cut to size to make sure the cake doesn't get ripped up trying to release it from the pan. 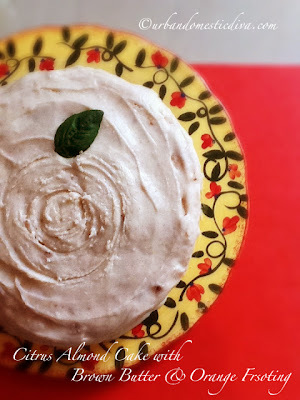 Enjoy this cake with some orange spice tea. Preheat oven to 350˚, Spray a 9" pan with non-stick cooking spray. Cut a piece of parchment to size and lay on the bottom of the pan. Spray lightly one more time. Set aside. In a small bowl, mix the cake flour, baking powder and salt. In a large bowl, cream the butter and sugar until light and fluffy. Add the egg yolks and whip until a light lemon color and fluffy. Whip in the milk, orange marmalade, extracts and liquors. Turn the mixer on low, and add the dry ingredients slowly until combined. Don't over mix. Pour the batter into the prepared pan. Bake in the center of the oven until golden, puffy and toothpick in the center comes out clean, about 45-50 min. Set on a cooling rack to cook completely. Meanwhile, melt the butter over medium heat. Simmer the butter until it foams up, and the butter becomes a light amber color. Set aside to cool slightly. Whisk in the sugar, vanilla and orange juice. Add the juice slowly, and only enough until the frosting becomes creamy, fluffy and spreadable. It may be 1/4 cup, may be more, or less. Frost the cooled cake generously. Add some sugared orange rinds as a garnish or orange colored sugar.